also got Spoons 2Di March? a couple to die for pullouts from K in it. 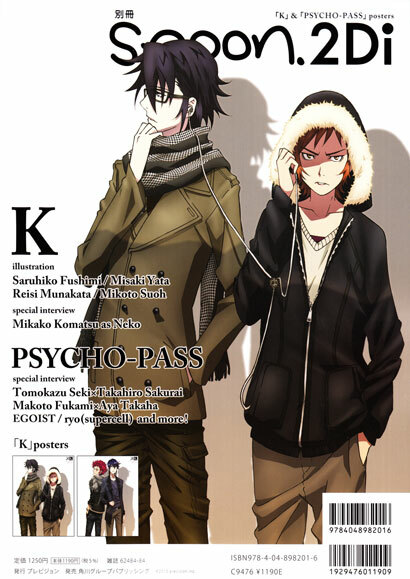 reverse is PSYCHO-PASS, but this is a K post. Sorry. Now to decide which to vector or neither. Tempted to do a Karneval vector next. What kind of magazine is Spoons 2Di ?? Saw a cover of a different issue on Amazon JP other month but without any clue I didn't want to get something that might be just mostly TEXT. ahh.. well there's quite a bit of text, but there is also a good amount of pictures. In this issue there are a interviews making up for the biggest amount of the text. Character focuses. I'd be likely to get another issue at some point. Sorta wish YA had this one. CDJapan is where I got it.